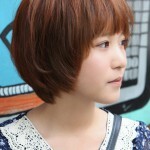 This casual medium length wavy haircut is a clever way to cover any crow’s feet and eye wrinkles! From a blurred center-parting, Sienna’s hair moves down to shorter lengths draped over the sides of her face. And the long fringe accentuates the cheekbones and a lovely smile instead! With a touch of edgy dark roots, the look is ultra-casual with tousled, loose waves. Tousled wavy hair creates plenty of natural volume at the sides, which makes it a good style for anyone with long, fine hair! And if you’re in the process of growing-out a fringe, this attractive easy-style look, will also keep you totally trendy! 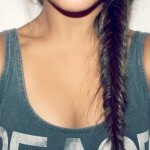 This is a great hairstyle for summer!